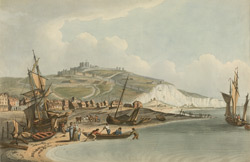 The travel writer Celia Fiennes visited Dover Castle in 1697 and commented on the magnificent view and position of Dover castle. She also noted that: ''the Castle is left much to decay and ruinated, only a small apartment for the Governor of three or four roomes, else the whole is spoyl'd, the floores taken up and wanscoate pulled down.'' Daniel Defoe was even less impressed, writing: ''Neither Dover nor its castle has anything of note to be said of them; the castle is old, useless, decay'd, and serves for little."